Hi, I'm Jotaauvei and I'm a game designer (wannabe). After years using RPG Maker just for fun I decided to make games, short experimental games as a test for myself and to have somethig to show. 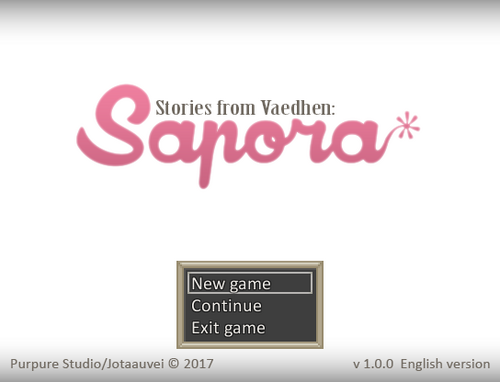 For Sapora I wanted to test decisions and open world. Vaedhen is a world I created to gather all the small projects like this one that I'll make (next one Stories from Vaedhen: Antala). I'm from Spain so they'll be first launched in spanish and some time later translated to english. I use this ocassion to apologize for all my spelling mistakes. I made all the graphics by myself, tiles and sprites. Not a big deal, 16x pixel simple plain textures (but mine 💖). You can see the credits on the music, code and other stuff at the end of the game. I hope you enjoy the game at least a half I enjoyed making it. This is not all I can do and will do. Backgound art 'Natta' by Andrés Gil Vázquez. Natta wants to collect the rarest flowers to become the best florist in the world.